Lot # 39: 1957 Topps #10 Willie Mays (SGC Mint 96/9) - “1 of 2 SGC Examples”; NONE Graded Higher on the COMBINED PSA & SGC “Pop” Charts! 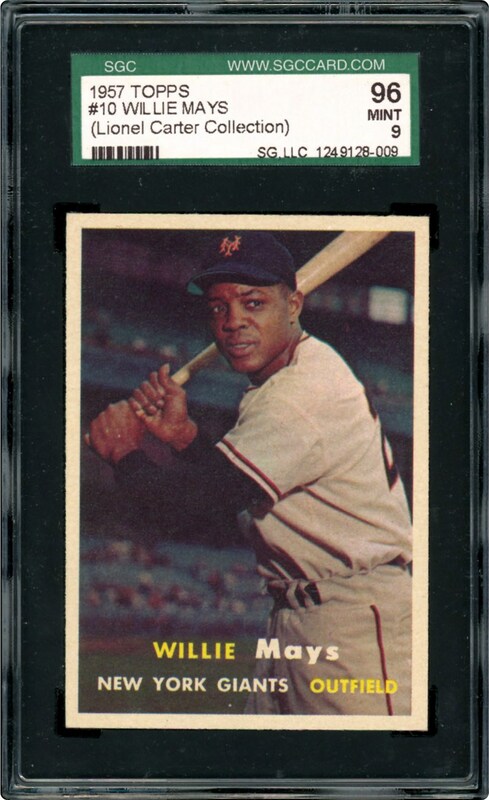 1957 Topps #10 Willie Mays (SGC Mint 96/9) - "1 of 2 SGC Examples"; NONE Graded Higher on the COMBINED PSA & SGC "Pop" Charts! 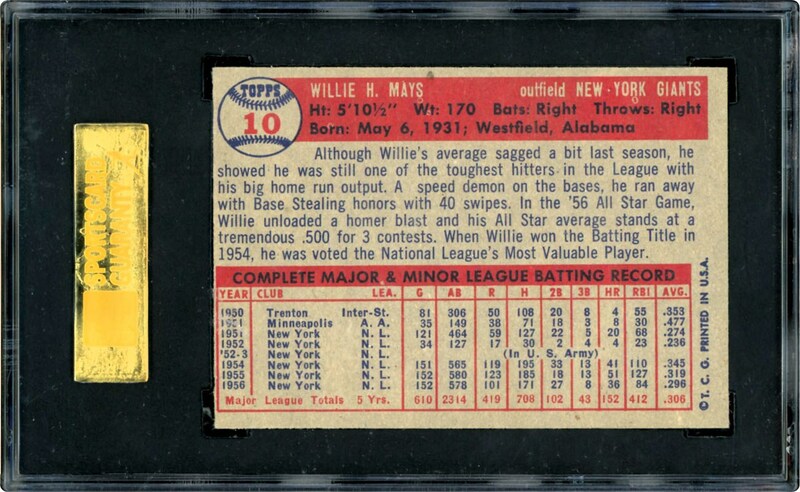 Most advanced enthusiasts would agree that the most unfathomable attribute of this 1957 Topps SGC Mint 96/9 Willie Mays highest graded gem is its virtually "dead-on" 50/50 centering. Simply stated, finding a 1957 Topps Mays subject with an extremely well positioned image is synonymous with the classic metaphor "finding a needle in a haystack"! Currently, BOTH SGC and PSA have not graded a single "Gem Mint 10" copy with this truly breathtaking marvel sharing the "best of the rest" title with only a SOLE other SGC Mint 9 example. Yet, its aside from its pinnacle "pop chart" standing, it is the breathtaking and near-impossible centering that renders even the elite collector speechless. The 1957 Topps issue was plagued with an abundance of poorly centered subjects, and locating a finest graded specimen sporting near-perfect centering is an excruciating task to say the least. The brilliant Mays batting pose is virtually pristine, depicting the finest possible resolution between four dazzling white borders. Razor sharp corner tips, pristine surfaces and vivid print registration are additional qualities substantiating the premier assessment. Willie Mays would enjoy a sensational 1957 campaign via his 38 homers, .333 batting average and 20 triples, with his incredible batting achievements clearly synonymous with this breathtaking gem that irrefutably shares the title as the "finest of its kind"!